Appliances for this home were important to us, as we were going for a clean look, but sticking to a budget was also high on our list. Imagine our surprise when we found four of the seven kitchen appliances we needed secondhand! A wall oven was an easy choice; we love the idea of it being more eye level than a traditional range. It also seems that many original MCM kitchens have a wall oven and separate cook top. After being disappointed in the look of many wall ovens at the big-box stores, I started looking at the IKEA wall oven/microwave options. I loved the look of the NUTID microwave/oven combo, and it was a heckova lot cheaper than the Whirlpool version I had found....and the kicker? Whirlpool actually makes the IKEA appliances. I brought Greg to IKEA one rainy afternoon, and after chatting with another customer in the faucet department, I showed her what we were buying. Come to find out, she had a friend selling the set. WHAT?! Are you kidding me? Sure enough, her friend had purchased a traditional home in the 'burbs of Detroit, and hated the set because it was too "modern" for her liking. We drove to this random woman's home and bought it from her. Saved $1000+ right off the bat. Talk about being in the right place/having a conversation with the right woman at the right time. The perfect cook top was a bit harder to find. We were looking for one with a very straight grid, and the less fussy, the better. We wanted one with stainless knobs, and actually ordered a Maytag one we liked better than this one, but were informed it was no longer being manufactured. We ended up with the Whirlpool one above, with black knobs, which will be fine. We went for the 30" option since the space we decided to put it in wasn't the largest. Super simple cook top from a lower-end manufacturer = affordable! And of course, since we don't have a microwave above the cook top, we needed a vent. The previous owners didn't have one, and the house smelled like various foods, so we knew this was important to keep the house smelling free of bacon, etc! We went with a super simple Broan version and are excited about both the form & function this hood will provide for our cook top area. We had been looking at this fridge for years. 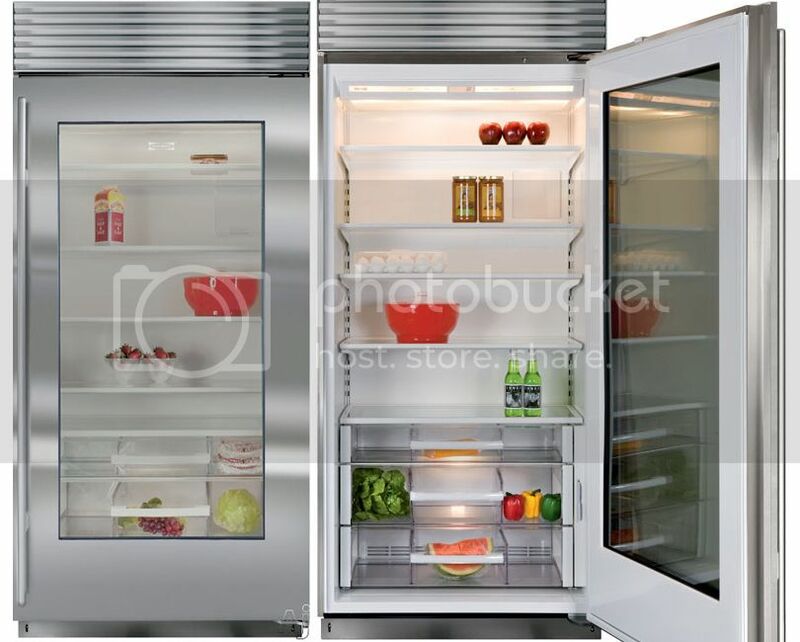 It's the one on our "dream wish list", as "if we won the lotto, we want this fridge for our house"! We actually fell in love with the idea of a glass door fridge years ago, but it made no sense to put it in our current home. We also love the fact this fridge is literally 24" deep - the same depth as cabinets, meaning this will sit flush and not stick out into our walkway between the cabinets and the island. Have I mentioned Greg is the king of Craig's List shopping? Never buys anything, but the guy LOVES to search Craig's List for just about anything - mostly boats and trucks, but also MCM furniture finds and oddities. Imagine my utter surprise when OUR DREAM FRIDGE popped up on Craig's List. From what we understand, someone had purchased it, and it didn't end up fitting in their already-constructed kitchen, so it was brand new, in the box, and 1/8 of the cost - this guy needed to unload it. Of course, we had to drive a few hours with a truck & trailer to pick it up, but that was fine with us - we've driven all over the state for Craig's List finds! It sat on Craig's List for a month. We watched the price drop, and when we thought, "We can't miss out on this deal!" and "Can this be the real? ", we emailed him and arranged to check it out. We have had it hanging out in our new garage since the day we closed; it's the first thing we bought for the house and actually picked it up a couple of weeks before closing! Yes, yes, I realize the fridge will always need to be organized, which is fine with me, since that's how we live anyway. I love the idea that I can see everything we have in the fridge without opening the door. Perfect to save a bit of energy by not opening the door every time you want to peek at what's available for a snack or drink. And the final two appliances will be "hidden" with cabinet-matching panels and pulls that will seamlessly flow with the rest of the cabinets they are surrounded by. The first is the dishwasher. I actually found this dishwasher listed on Craig's List, but I wasn't quick enough this time - someone bought it before I could pick it up! And Greg didn't LOVE the idea of a used dishwasher, so it worked out okay. We decided on this one because we have it at our current home and love it. 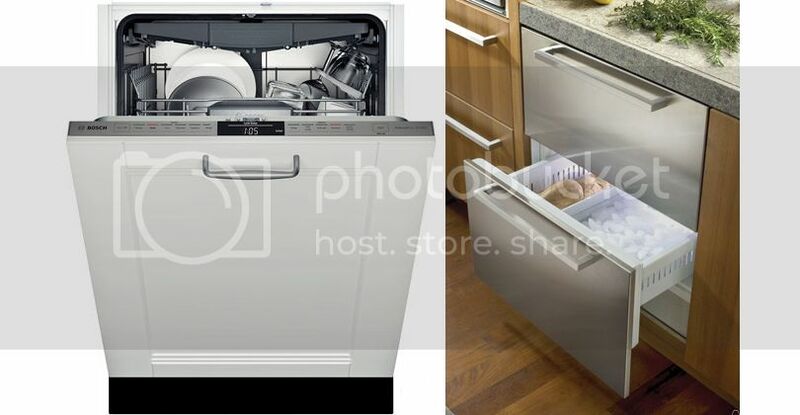 While I LOVED the idea of the two-drawer dishwasher by Fisher & Paykel, this was much more affordable and I LOVE the idea it won't stick out like a sore thumb in our bank of cabinets. The second is a freezer and ice maker. Since our fridge is literally a fridge-only, we needed someplace to store the small selection of frozen goods we consume. We're not huge freezer people - so having a huge freezer wasn't important to us, but I do prefer ice in my drinks, and we do freeze the occasional item. This was also a secondhand purchase from the guy with the fridge - he ended up getting a fridge WITH a freezer, so didn't need this item either. LUCKY US, we saved 75%! Wow - great finds! I am impressed by your ability to get a good bargain! It's going to be amazing! I wish we were even half as organized as yoi about these house/moving projects. We might have boxes in our house forever.